Today's article come from John Davenport, published by Digital Photography School. Photography in general is easy – right? You pick up your camera, point it in the direction of what interests you, and depress the shutter button. However, there are many levels of photography, and I’m sure many of you are aware of the basics. Today I’m going to focus on something a bit more advanced, photographing the star filled sky, also known as astrophotography. For astrophotography you will be delving a bit deeper into the use of some of the manual controls of your camera like shutter speed, aperture, and ISO control. I also highly recommend shooting in RAW for night photography, as it will allow more control when editing the final image. 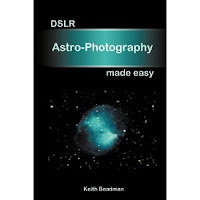 If you wish to study Astro-Photograohy in greater detail, you may find this book, DSLR Astro-photography Made Easy of interest. It's never been easier or cheaper to take photographs of deep sky objects. This book leads the reader through the entire process from setting up the telescope and camera, identifying suitable objects, taking the photos and then gives an example of processing the photos to reveal the exquisite detail. Most of the software used within the book is available FREE and can be downloaded from the internet proving that you do not have to purchase expensive software to participate in this challenging hobby. New Nikon 1 J2 launched.